Costs have ballooned to £42 billion (excluding trains!) according to official DfT figures. But HM Treasury insiders speak of costs approaching £80 billion. HS2 supporters say increased costs include a huge contingency – but so did the original estimates. 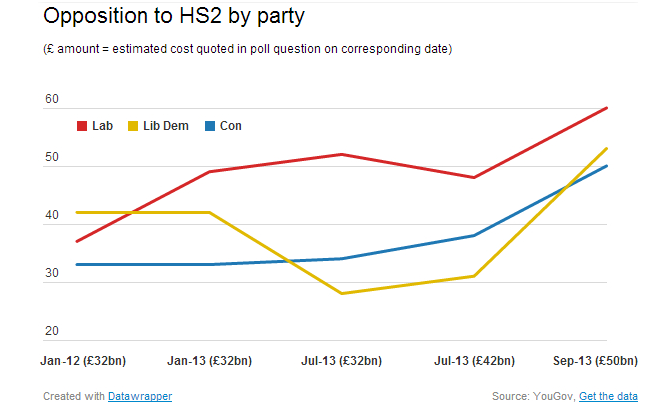 HS2 costs are disingenuously reported in 2011 prices – ignoring the last two years of inflation. What do Labour voters think? HS2 is a vote loser. Most Labour supporters (60%) oppose investment in HS2 according to a recent poll. And grassroots Labour opposition is strongest in areas of traditional Labour support. BUT “REGIONS WILL BENEFIT FROM HS2”. SO WHAT DO ACADEMICS THINK? BUT IT’S ALL ABOUT CAPACITY! We are told the West Coast Mainline is full. Actually the evidence shows that it is not. As corroboration, figures forced out of the government during a Judicial Review revealed that in the peak three hours in the evening, trains heading north out of Euston were only just half full, with an average loading factor of 52.2%. It was also shown first class carriages were on average during those three peak hours only just over a third full, with a 35.2% loading factor! In contrast, several stations are classed as over capacity with routes to Paddington, Moorgate, Liverpool Street, London Bridge and Waterloo all coming in over 100% in the busiest hour. The evidence is conclusive. 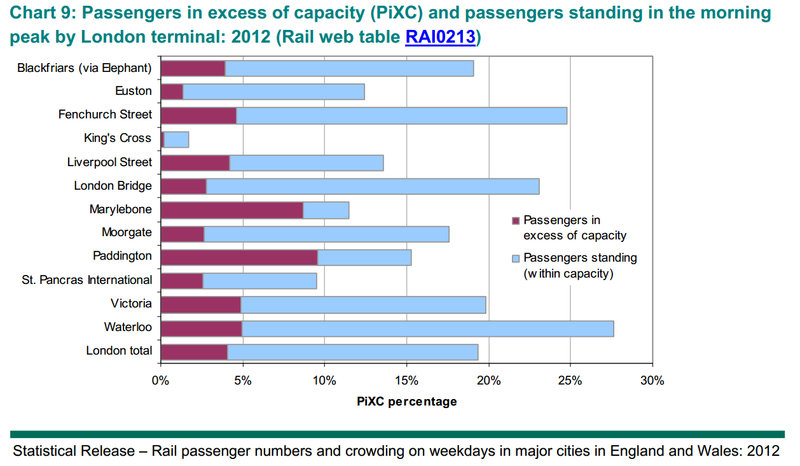 So if there ARE rail capacity priorities, then Euston and the West Coast Mainline are not it! Obviously some trains will be fuller than others. But this happens everywhere on buses, tubes, and roads too at peak time. Even so, at the most crowded peak times of day rail services into Euston are among the least crowded in London not the most (see the chart below). So West Coast Mainline capacity isn’t a problem or a priority. Nor was it when influential high speed rail lobbyists Greengauge21 were established in 2006 – long before any Network Rail capacity studies. Nor was it a problem or priority when HS2 Ltd was set up 3 years later in 2009 (drawing largely on the work by the Greengauge21 lobbyists). Alternatives put forward (for example such as RP2, RP3 and the 51M group of councils’ proposals) could provide sufficient capacity whilst also leaving £bns for more urgent priorities elsewhere. DfT forecasts have been persistently wrong, most notoriously with HS1 (Channel Tunnel Rail Link). So high growth forecasts should be treated with extreme sceptism. In fact there are already signs that rail growth is slowing. The official statistics from the ORR show that long distance growth has eased back to 3% – lower than in forecasting models! – and actually became negative towards the end of 2012/13. Not true and an unhelpful resort to the infamous Thatcher-ism “TINA”. There is no excuse not to explore alternatives put forward such as RP2, RP2a or ideas from the 51M group of councils. Any further work on HS2 needs to be stopped until this detailed work is done. Alternatives indicate that significant enhancements could be achieved for a little as £2.6bn whilst achieving time savings of 12 minutes to Birmingham. £42bn, £50bn or £80bn – whatever it is ought to be spent more wisely on a range of more urgent priorities and better investments. That is the overwhelming conclusion of experts, academics and Labour supporters. At this conference Ed Balls has already mentioned that the next Labour Government will inherit a £90bn deficit and that Labour supporters should not expect reversals to huge Tory cuts. Anything spent annually on HS2 is money that should be spent on better projects that benefit more people sooner.